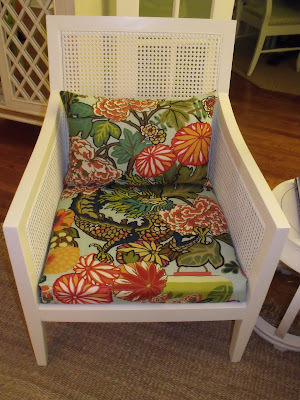 The other main project I tackled this weekend was the seat and pillow of the white cane chair in our living room, which has been the BANE of my existence since I bought it last summer. I happened upon this perfect specimen for our living room at HomeGoods one fine day and actually scored a nice discount on it because it was missing its seat cushion. Now, most normal people would walk away from a chair with no seat, but I saw it as an opportunity for a discount thinking the seat would be a cinch. Looking back, I was wrong. Well, I wasn't wrong so much as uneducated about the proper way to go about getting a seat cushion. I tried a million different foam/fabric combinations and nothing worked. I finally wised up and bought the proper seat cushion and now will be confident (with good reason as opposed to stupidity) when I happen upon another chair in need of a seat. In the meantime, I've spent triple what my discount was (not to mention lots of time)....lesson learned. 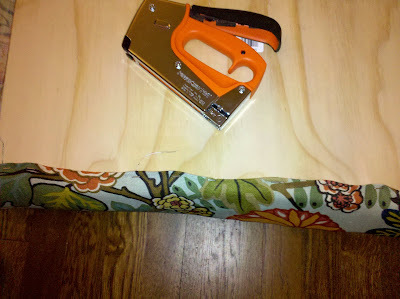 I knew that I was going to be limited on fabric, so instead of fashioning a true cushion with a full cover, I decided to trace the seat bottom on to a piece of thin plywood. I then attached a piece of foam (pictures below) to the plywood and covered the foam/plywood combo with staples like I would any chair seat - this had the advantage of eliminating any sewing as well as saving fabric yardage because I only had to recover the top of the seat as opposed to sewing a whole cover for a cushion. Lucky for me, the seat popped right out of the bottom and I was able to trace it onto a thin piece of plywood (on the upteenth try...I went through many plywood thicknesses until I realized the thinner the better). 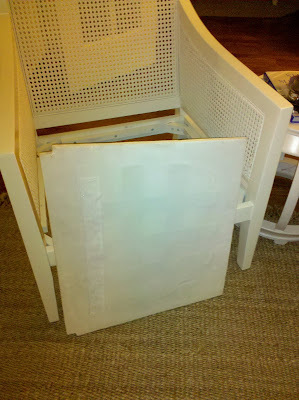 I bought a ready-made seat cushion from Joann Fabrics...I initially went the route of buying thick foam and cutting it to the size I needed, but that foam was NOT meant for sitting - it was so hard and thick...another lesson learned. I thought the ready-made cushion was going to be too small, but once covered with the fabric, it actually ended up being OK. I still had to shave it down a bit with a box cutter knife as it was a bit longer than my plywood. 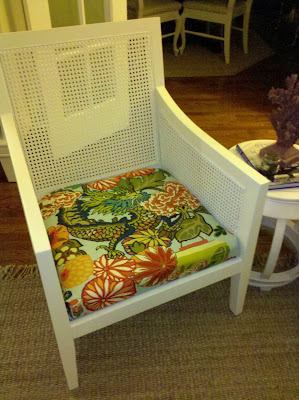 Here is the cushion atop the plywood with the star of the show, my Chiang Mai Dragon fabric. 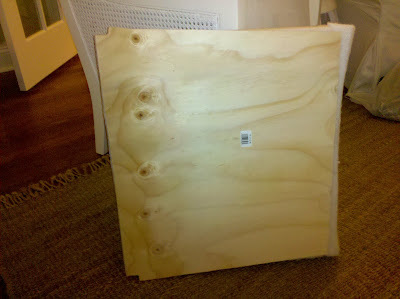 Before I started stapling dear Chiang Mai to the cushion/plywood combination, I did spray the cushion with a bit of spray adhesive and stuck it to the board to help keep it intact through many tushes. And after a couple of minutes, my seat was complete! I then took the rest of the yardage and fashioned a very simple pillow to the dimensions I wanted for the back of the chair - I stuffed it with regular ol' pillow stuffing that you can buy at any craft store. I was able to use the exact full yard of fabric for both the seat and a small two-sided pillow. Wow, you had a very productive weekend. I love this.....and love the details on how you got the look. You must be so pleased. Oh yes, Chiang is goooood! Looks great. Life and decorating is always learning the hard way and as you go isn't it? Great job. Thanks for the tip about using a ready made cushion, excellent idea. She is looking amazing- what a good use of a yard, it really can go far because it has such a great pattern and fun colors! Love this fabric...! I sooo know what it is like when seemingly easy projects seem to take FOREVER! But it looks fabulous- good for you! We love your DIY project. 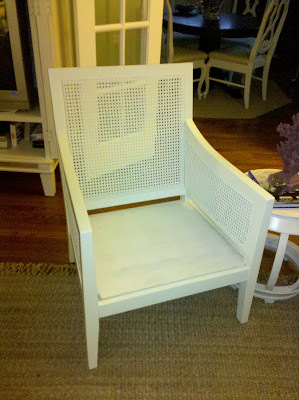 That chair looks wonderful.We love your blog, we found you through 6th Street Design. Wow, your chair looks amazing! 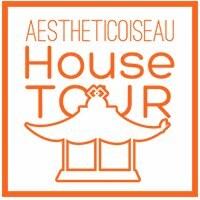 I just popped over from 6th Street Design and will be becoming a follow, loving your blog! Wow, I love it. Great job....I can't get enough of chiang mai....love the fabric! wow! i am in awe. thats such a beautiful chair....swoon! 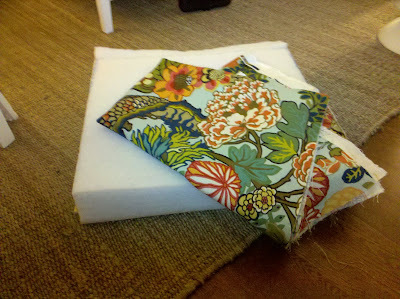 This is a wonderful idea for recovering cushions w/out paying the price for reupholstering! Thanks for sharing this. Oooooh. She IS looking fab! great use of 1 yard of fabric...sweeeet. Chiang Mai in Aqua is my favorite fabric ever, ever! I love it so much that I keep inflicting it on my clients - I just can't help myself! Thanks very much for the posting - your blog is lovely!